Conventions, events, entertainment venues, congregations, and more can benefit from the smooth and flexible DynamiCam Cable Camera System. A cable camera system provides dynamic aerial coverage without excessive noise or the unpredictability of other solutions such as drones. This camera system includes a 3-axis gimbal-stabilized head which can support a Blackmagic Design Micro Studio Camera 4K, and links it to the included pilot and camera operator consoles, as well as separately available I/O equipment via fiber optic connection. Four winches with cables and all necessary accessories to move the gimbal with the camera are included as well. This Control Box is the main hub of the DynamiCam system. It fits in a standard 19" equipment rack and connects the components of the system together. Using the joysticks on the DynamiCam Pilot Control Console, an operator can move the gimbal unit to track subjects or perform dramatic camera movements. This controller also works in conjunction with the GUI for programming camera movements. The DynamiCam Winches, in a pack of four, are responsible for holding and ultimately moving the gimbal unit. Each winch comes with 250' of steel wire and a fiber optic connection cable. Emergency stop and automatic cable slack detection are built into each winch for safety. Each winch unit needs to be driven by its own Driver Box. The DynamiCam Winch Driver Boxes control each winch through communication with the Control Box. A C13 to NEMA 6 cable is included for powering off a 220V circuit in the US. The DynamiCam 3-Axis Gimbal Stabilized Head connects the camera to the cables. Having the gimbal stabilizer built-in lets the DynamiCam system achieve smooth aerial shots with small cameras weighing up to 6 pounds. The pan axis can rotate a full 360° for flexibility in subject tracking around the camera. Video and power are transferred to/from the head and camera via the copper and fiber optic cable connections, respectively, and through the winches to the control box, so there is no need for extra cabling. 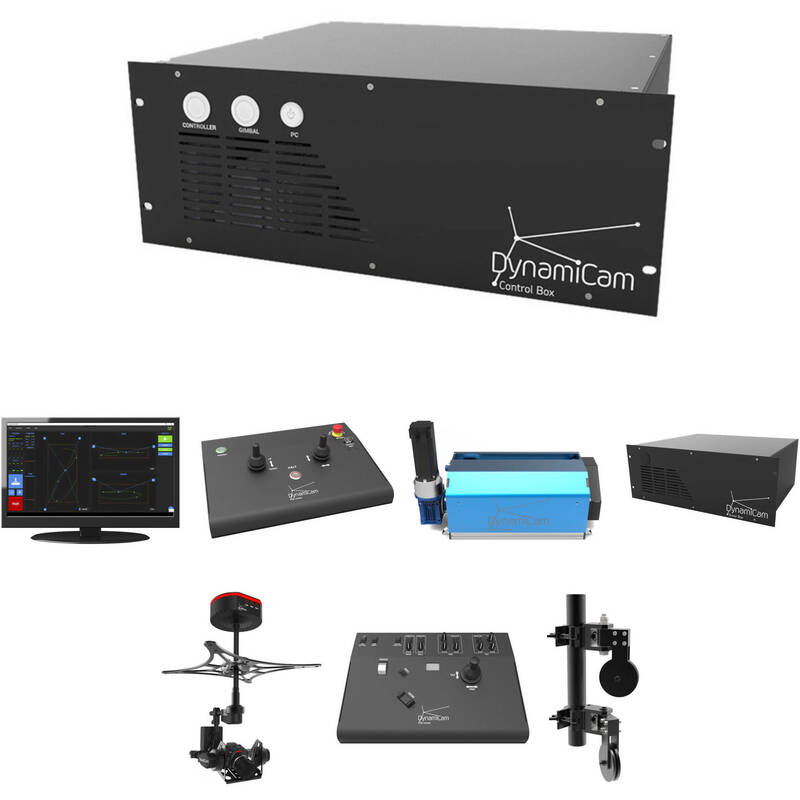 The DynamiCam Control Console for Camera and Gimbal offers complete control over the motorized gimbal platform and essential camera control. Pan, tilt, and roll controls let you position the camera to frame your subject, and the focus and zoom lens controls ensure a sharp image at the focal length you require. Speed, ramp, and sensitivity controls can adjust how the controls respond to your input. The directionality of controls can also be reversed.